She was the first Muslim lesbian character played on a mainstream primetime soap in Britain. Now she's being killed off. Newspapers today reported that Coronation Street's Rana Habeeb, played by 34-year-old Bhavna Limbachia, will be written out of the show in coming months. There is speculation she will be 'killed off' in a spectacular story but that has not been confirmed. 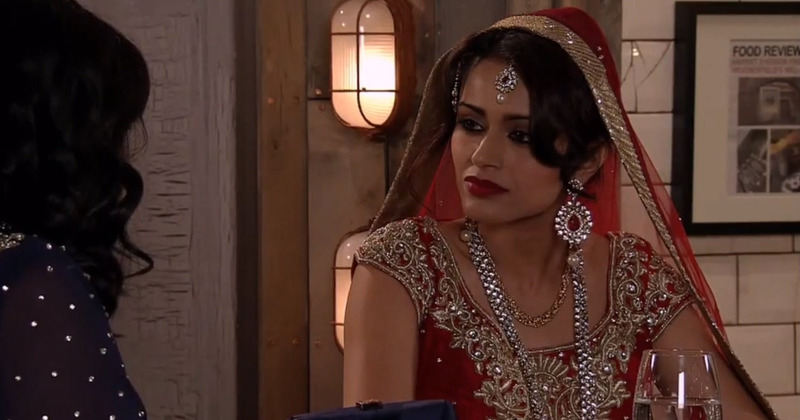 Actor Bhavna Limbachia has previously had roles in Doctors, Casualty and Citizen Khan. Her role in Coronation Street did not prove to be controversial but she tackled sensitive issues. In a recent interview she was asked about the extreme measures her parents (in the soap) go to keep her apart from her partner Kate. She said: "I’ve been working with the Naz and Matt Foundation and have heard many stories about saving face in the community. They do go to extreme measures to cover up anything they don’t agree with. Physical violence and kidnappings are not uncommon within the Asian community when it comes to their child’s sexuality." She also added: "It’s very important, people need a voice, this issue is still very taboo in the Asian community, and other communities, and I think it’s important to raise awareness. Hopefully we can spark conversation and let people know there’s support available if they find themselves in this position." Last year she was nominated for Best Actress in the British Soap Awards.